2018 will be a milestone year for the Adirondack Country Store on Main Street in Northville. Established in 1988 and celebrating 30 years in business in May, this gift store started in its current location and has grown and thrived in this small, historic village on the Great Sacandaga Lake. The Adirondack Country Store specializes in cabin, lodge and rustic Adirondack-style home décor, distinctive hand-crafted furnishings and unique one-of-a-kind gifts. The store and its owner Joyce Teshoney not only serve local shoppers, but also sell to customers who live across the US and beyond via the store’s website, social media platforms, Etsy and even Amazon. The story begins in 1983 when Joyce’s husband Steve accepted a job in our area. Joyce and her husband were excited about the prospect of moving to our region because they were boaters and Steve is an avid fisherman, and they were drawn to the Great Sacandaga Lake. They bought a house and relocated to Edinburg. The Adirondack County Store began when they had an idea for selling Adirondack gifts and tested the waters by selling items via mail order for a year or two. This was a successful endeavor for them, and they began looking for a retail location in Northville. When they bought the building at 252 North Main Street it needed a lot of work. It was a three-apartment building that they converted into the store, and a second-floor apartment which they still rent. Even with all the renovation work that was needed, they still managed to open for business two weeks to the day from the closing – just in time for the busy Memorial Day weekend. Thirty years ago when they opened, there was little business going on in the village – at the time the only retailers in Northville were the Adirondack Country Store and the Northville 5&10. But as Northville has grown, so has the Adirondack Country Store. Joyce attributes part of her success to really listening to her customers and what they are looking for. When the Adirondack Country Store first opened she confesses that she didn’t really have a good idea of how to add to her inventory, but her customers gave her good advice, were always looking for unique and new things, and she took off from there. She gives her customers a lot of credit, and she and her staff continue to be devoted to good customer service. If you want something in particular, they will do their best to find it for you. The store, and Joyce, also serve as Ambassadors to the village and region, often times being called by out-of-towners who want to know about weather or snowshoe conditions or the like. The Adirondack Country Store thrives on a good balance between in-store retail and internet sales. Many of Joyce’s mail order customers are people who own property nearby and are only in the area part time, but want a piece of the Adirondacks to be part of their lives when they’re not here. The Adirondack brand is certainly a powerful one and evokes something strong in all who visit or live here. Over the years, Joyce has gained quite a taste for what works, and what is inherently “Adirondack,” and tries to carry as much locally produced product as she can find. Joyce is involved in the Northville community, and has been since she started her business here. She has been a member of the Northville Merchants Association for a number of years, as well as being a supportive member of the Chamber for 25 years in 2018. She and Steve raised their family in Edinburg on the lake, with all of her children attending Northville schools. Carla Kolbe nominated Joyce and the store for this award, and in her nomination she writes, “I am proud to be an acquaintance of Joyce. She has shown incredible insight, strong perseverance, and an extraordinary business sense to remain a woman in business in this small, seasonal village. From my years of observation, I can tell you this accomplishment was no easy task. Joyce has poured her heart and soul into her store. She has worked diligently, but her dedication has really paid off." 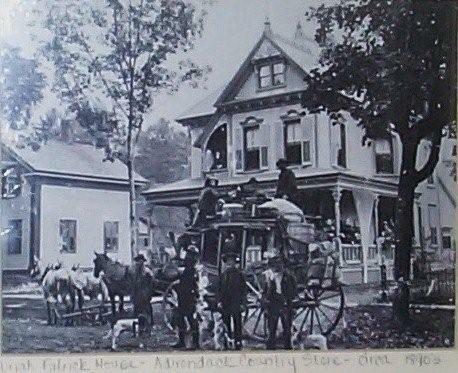 The building that is now the Adirondack Country Store was originally built as a home in the 1890's. 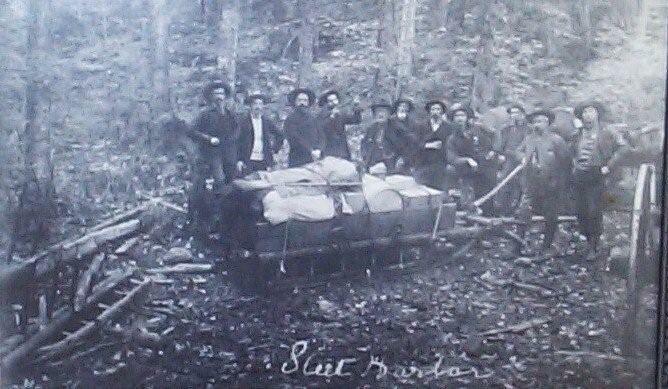 The home was built by Uriah Patrick, a local blacksmith. 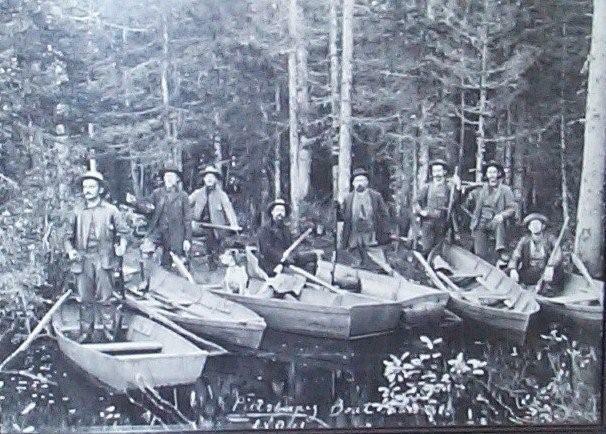 Uriah was a serious hunter and fisherman and belonged to a local group that went on hunting trips together. These pictures show the group, made up of many Northville men. 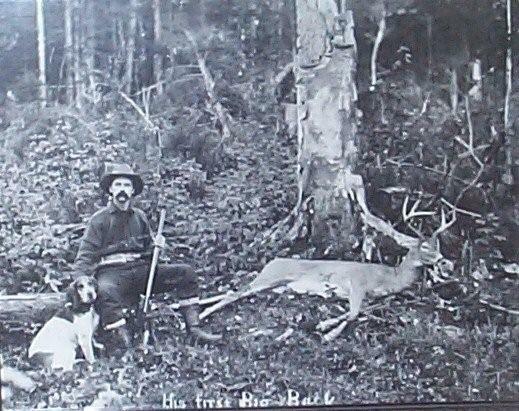 The picture with the deer is Uriah and his dog. Uriah and his wife Belle are buried in the cemetery just up the hill from us and we like to think they are keeping an eye on us. A favorite item here is a horseshoe that was found in the back yard. This hangs in the hallway of the store we like to think of it as a good luck token from Uriah and Belle. We're going to be in the movies! We had fun working with the set designers for a Tyler Perry movie. They chose a number of products to decorate a cabin set for their production, "Why Did I Get Married?" Watch for it and see if you recognize our items!